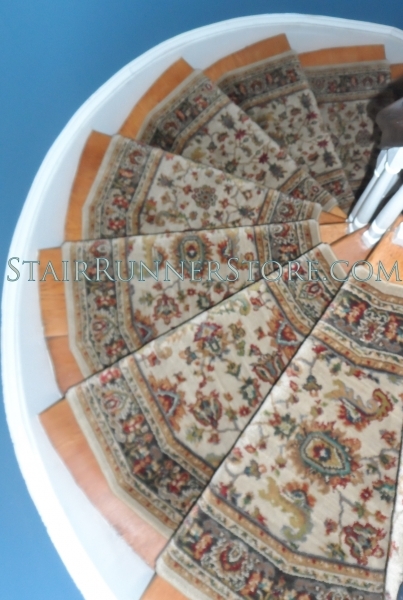 This web site and documentation are copyrighted by (SRS) The Stair Runner Store, Creative Carpet & Rug, LLC. The website and documentation are supplied "as is", with the only accompanying services being those explicitly stated on the SRS website. SRS does not warrant that the operation of this website will be uninterrupted or error-free. The end-user understands that the website was developed for sales and research purposes and is advised not to rely exclusively on the website for any reason. Cancellation and Changes: Runner products and stair hardware are considered custom orders, and therefore cannot be cancelled or changed. SRS will process an order in a timely manner. Many of our manufacturers will then process the materials to be cut within 24 hours. For this reason, cancellation or changes are not possible. Under no circumstances may an order be cancelled or changed after the material has been cut. Upon delivery of an order, please inspect the package for damage immediately. See Shipping Policy. If the package arrives damaged, alert the driver at the point of delivery. Photograph the package before opening. Damage claims should be filed against the shipping company. SRS is not responsible for packages damaged during transit. When filing a damage claim, the original package that the product(s) arrived in should be saved. Once opened, verify that it includes what was ordered. SRS has your material orders shipped here to us for inspection, we repackage and ship to you - so an incorrect product or other problem is very unlikely. Dye lots may vary from samples or swatches and are not considered a defect. Color calibrations of computer monitors also vary. All items ordered through the SRS website are subject to the SRS Return Policy. Please see the return policy for complete details. Most of the products we sell are custom orders and therefore are not returnable - returns are exceedingly rare and only for specific and very limited reasons. Items such as area rugs are be subject to restocking fees and/or shipping and handling fees. The customer is responsible for the safe return of any products, including damage or loss during the process. All returns must be approved and the customer must receive a return authorization before shipping back to SRS or the manufacturer. Returns without a return authorization will be refused, and shipped back to the customer at their expense. All Runner widths are Stated or Approximate. Runner width may turn out to be exactly as stated - but can vary by more than an inch. However, if there is a width difference, we often see about a 1/2 inch difference from the stated width. A variance in width is not considered a defect. If you are very concerned about the width of your runner, a cutting can be ordered from the runner material in stock with the vendor. This is generally at a cost of the 1 foot price plus shipping and is non-refundable. SRS assumes no responsibility for incorrect customer orders or inaccuracies in customer measurements when ordering any product, including a custom product or landing fabrication. Most orders require full payment at the time the order is placed. All orders are non-returnable and non-cancellable. In some cases an extended back-order may be handled with a 50% deposit - please inquire. In that case, the remaining 50% will be charged before any custom work is done on the material and before shipment to the customer. SRS maintains ownership of all products until the amount due is paid in full. Orders that include customization by the manufacturer will require full payment at the time the order is placed. 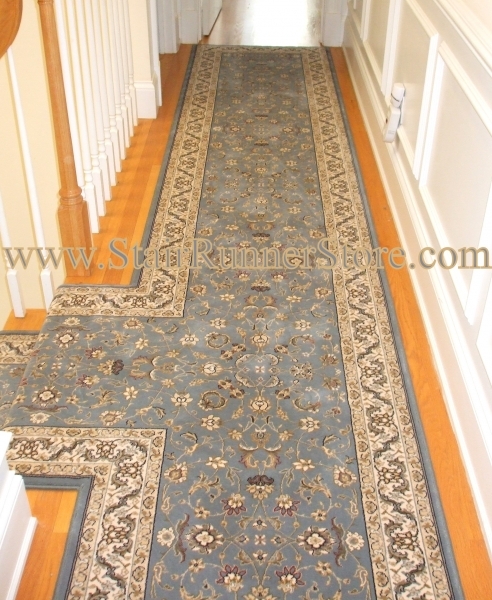 Sales Tax: The Stair Runner Store is based in Connecticut. We are obligated to collect and remit sales tax at 6.35% for any orders shipped to a Connecticut address. We are not obligated to collect or remit sales tax when products are shipped to states other than Connecticut. (Orders shipped to all other states will not include sales tax.) Many states and municipalities have laws requiring the consumer or end user to pay any tax due, directly to their state or local revenue department. 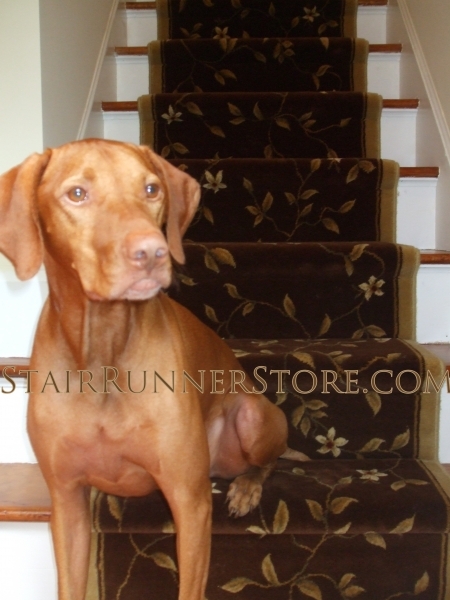 The Stair Runner Store will not be responsible for any tax that may become due on your order. SRS reserves the right to change its prices at any time, with or without notice. IN NO EVENT SHALL SRS BE LIABLE TO ANY PARTY FOR DIRECT, INDIRECT, SPECIAL, INCIDENTAL, OR CONSEQUENTIAL DAMAGES, INCLUDING BUT NOT LIMITED TO: LOST PROFITS, ARISING OUT OF THE USE OF THIS WEBSITE AND ITS DOCUMENTATION, EVEN IF SRS HAS BEEN ADVISED OF THE POSSIBILITY OF SUCH DAMAGE. SRS SPECIFICALLY DISCLAIMS ANY WARRANTIES, INCLUDING, BUT NOT LIMITED TO, THE IMPLIED WARRANTIES OF MERCHANTABILITY AND FITNESS FOR A PARTICULAR PURPOSE. THE WEBSITE PROVIDED HEREUNDER IS ON AN "AS IS" BASIS, AND SRS HAS NO OBLIGATIONS TO PROVIDE MAINTENANCE, SUPPORT, UPDATES, ENHANCEMENTS, OR MODIFICATIONS. In some cases an order will require the customer to agree to additional terms. These terms will be clearly communicated on a case by case basis by SRS via the customer’s provided email address. This circumstance may apply to but is not limited to a back-order, non-standard shipping requests and custom fabrication orders. 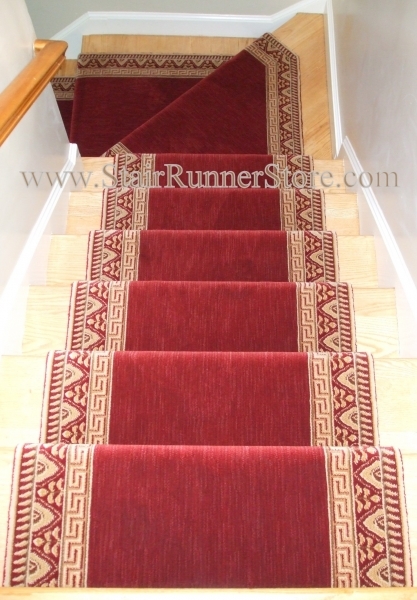 The Stair Runner Store reserves the right to update or modify these terms and conditions at any time without prior notice. Your use of The Stair Runner Store website following any such change constitutes your agreement to abide by the terms and conditions with those changes. We encourage the review these terms whenever you use this website. The revision date that appears at the end of this policy will indicate the most recent change. The purpose of this site is to promote the products and services of Creative Carpet & Rug LLC doing business as The Stair Runner Store. The services promoted are *installations services in the local service area, custom fabrication services, the sale of runner materials and related accessories available locally or for shipping. *We will travel to other locations depending on the project and distance involved. This is determined on a case by case basis - Please Inquire. 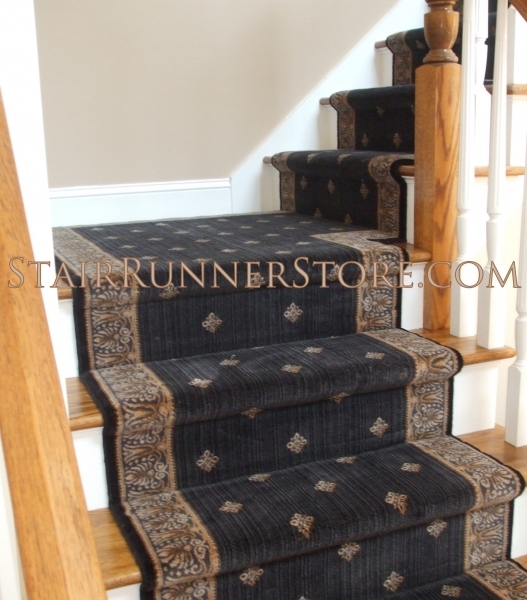 By placing an order, by submitting a form or other inquiry, you authorize The Stair Runner Store to contact you by phone at the number you've provided, including mobile phone, email or mail and using automatic dialing equipment, to give you information about Stair Runner Store products and services or to discuss the details of your project. We will not share your contact information, but may contact you with promotional information in the future unless you ask us not to. Colors you may see depend on your monitor, we cannot guarantee that your display of any color will be accurate. 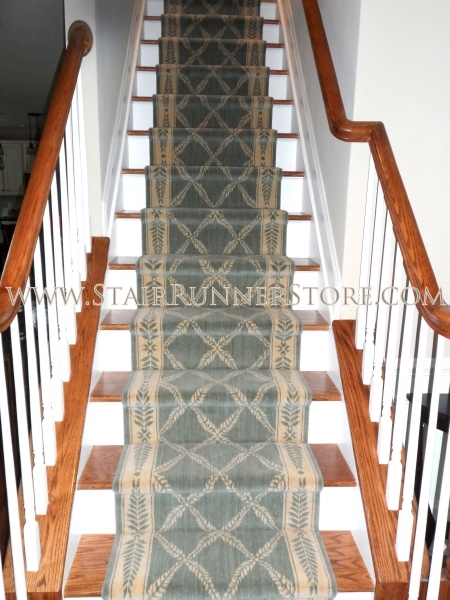 We do our best to display colors as accurately as possible both in the products samples shown and our installation galleries on The Stair Runner Store website. We urge you to make your final purchase decision based on an actual samples or a swatch of the product. Dye lots may vary from a product sample/swatch to that of the actual material. The only way to see the existing dye lot is to purchase a cutting from the material you wish to purchase - please inquire for these details. This site and all contents of this site are provided on an "as is" basis without warranties of any kind, either express or implied, including without limitation warranties of title or implied warranties of merchantability or fitness for a particular purpose. You acknowledge, by your use of this site, that your use of this site is at your sole risk, that you assume full responsibility for all costs associated with all necessary servicing or repairs of any equipment you use in connection with your use of our site, and that The Stair Runner Store shall not be liable for any damages of any kind related to your use of this site. you agree to defend, indemnify and hold The Stair Runner Store harmless from and against any and all claims, damages, costs and expenses, including attorneys’ fees arising from or related to your use of this site. The Stair Runner Store website contains outbound and inbound links to/from external sites that support our products and services, our distribution partners or related topics. Terms and conditions may differ on those sites and each organization may have a different privacy statement. You should review these policies each time you submit personal information on a web site.